David Moyes inherited Louis van Gaal too much home work to be done. So when Manchester United approach him to be the next manager, he had some time to think before he answer for a "yes". He said that Sir Alex Ferguson will be the legendary Man United manager and he will not going to argue with that. However Manchester United under his management will be different although Moyes leave him a broken team. He added his experience with Ajax, Barcelona, Bayern, and AZ will help him to progress and achieve what Manchester United had left out. 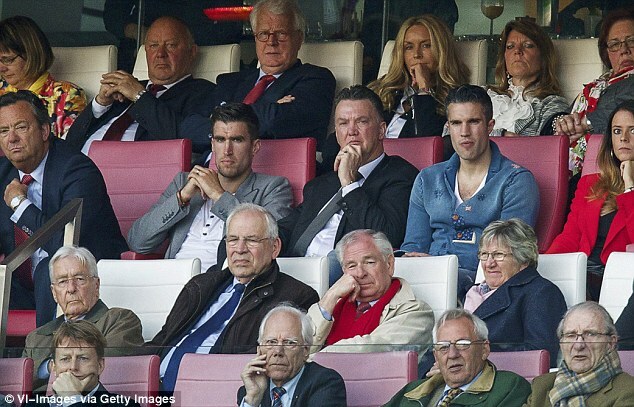 louis van gaal, van persie, and vermaellen? In order to make Manchester United back on top again with the difficulties Louis van Gaal admits he will not make the panic decisions. He is still asses the current Manchester United squad to play as he wants. Even tough news reporting van Gaal is eager to land Juventus Arturo Vidal, he still believe that the current Man United midfielder is need time to prove themselves worthy in his system. The remain speculation of new signing recently are Thomas Vermaellen and Kevin Strootman. Personally I would agree with the gaffer because the young trio of United defenders are still not play as the latest duo did. Louis van Gaal revealed his transfer policies to reporters who interviewed him in United Pre-season tour in America. He is determine that he will not just buy some player but "you only buy player to extend your squad selection". The manager added he still could not pick whose are fit to play in his 3-5-2 system. Rooney, Wellbeck, Hernandez, Mata, Herrera and Fellaini could play in this system and he could make assessment on them.